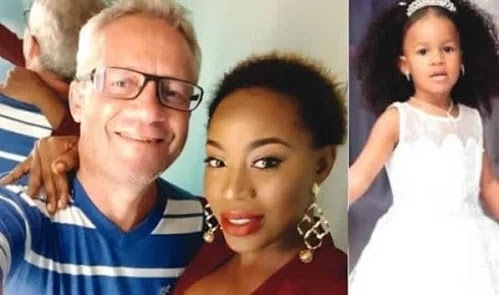 Mr Ali Madaki, the father of late musician, Zainab Ali-Nielsen aka Alizee, who was allegedly murdered by her Danish husband, Peter Nielsen, has given some insight about the marital life of the couple revealing how her daughter have been enduring domestic violence. Recall that Alizee, 37, and daughter, Petra, 4, were found dead in the kitchen of their Banana Island home on Thursday. “I have known my late daughter ’s husband for over seven years now. At the outset , he was of good character but last year , he started fighting his wife . Last November , a case was reported at the police station when he beat her to a coma . He then wrote an undertaking that he would never batter her again,” Madaki told The Punch. The sad father however called on the government to ensure his late daughter’s husband was dealt with accordingly to serve as deterrent to other foreigners. Previous Article Previous post: Agbada embroidery designs for male and female.